My personal experience downsizing - It happened to me! I’ve been lecturing and discussing the subject of downsizing a long-time home for over 20 years. It’s one thing to speak from other’s experience but now I can truly speak from my very personal journey through our purging journey! View my 10 steps to downsizing. I prepared this helpful document after my own experience. My wife and I were comfortably watching our favorite sitcom when a very calming noise blended in with our show. You know, that ocean-wave peaceful sound that many of us use to put us into deep sleep. It was coming from our main floor utility room where Jeanne was multi-tasking doing laundry while relaxing. It was time to investigate. To my surprise water was entering my kitchen floor from the laundry room at a fairly rapid pace. The wash machine decided it was lonely and need our attention as it screamed out using the only means available which was elimination of its water waste on to our new wood floor! I am familiar with gravity and its many qualities which generally move mass downward toward the lowest point which was my basement. Down the steps I went and ran to the spot directly under the wash machine. As I squished onto the carpeting I looked up and my ceiling was bulging so I thought I would poke my finger into tile above. Down came the ceiling with its water waste on to my head and body! Soaked and a bit bewildered I knew it was time to take action…you get the picture. After the insurance company contributed to my clean-out, I knew it was time to take off paneling on my basement wall. There it was, a crack in the middle of my basement wall, which meant repair. Being in the business I knew this would not be cheap but it was necessary. I called my favorite basement contractor, Accurate Basement Repair, and responded quickly by examining the problem. Excavation, bracing and a new sump pump were in our immediate future! In a twisted way I was thankful. To repair the walls we had to remove every treasure in our basement from over 30 years of stuff we saved for some future need. That was a wakeup call! Why were we saving so many items that had not been touched for so many years? Why did we avoid downsizing our home and putting up with a musty bunch of boxes which were crushed to unrecognizable? That’s another article. We decided to walk the talk and use the process and services that we have preached about to our seniors and their families for so many years. The cleanout began. Believe it or not, we had the basement totally vacant and personal treasure organized in 8 hours! This is how we accomplished this monumental task. First we called our team of professionals and scheduled them to come over one day before the basement work was done. We summoned our first responders, handyman Jerry and our cleanout team of Mitch and Tom. We had Jerry bring up two long tables and put them in the garage which became our home base for sorting, discarding and donating items from our basement. Jeanne and I purchased 20 plastic storage bins which became the new home for treasures we decided to keep. Mitch and Tom carried up the stuff and placed them either in a pile to the right for donation, a pile to the left for the dump or on the table for items to go into one of the plastic containers which we would keep. My wife Jeanne directed Jerry, the handyman, to help put the items into a plastic bin and Jeanne then labeled the container. By the time it was done in about 8 hours, we had a stack of bins with our treasures, the junk gone to a dump, and the items for donation on their way to Good Will. The basement was completely empty! Jeanne and I did not lift one item and saved our backs for another day. Next the basement repair was done which took one day! Then our painter John sprayed the walls and painted the basement floor. No more musty smell. No more junk. No more anxiety about the thought of downsizing years of memories and stuff. It was totally freeing. It was a catharsis of major proportions. It was a total relief. 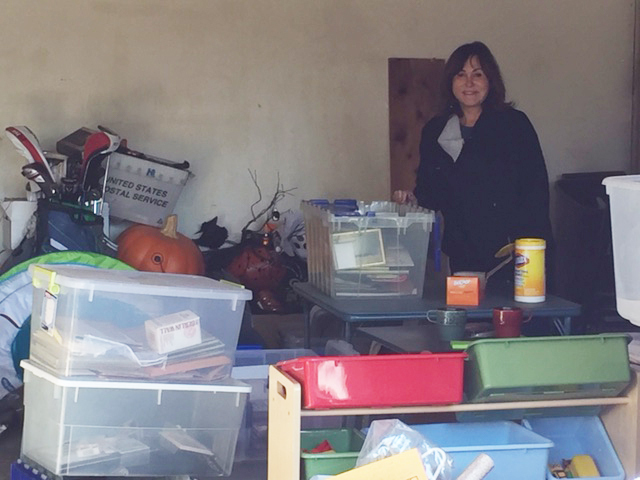 I am sharing this story because the biggest obstacle to moving for those of you who have been in your homes for many years is what to do with the accumulation of a lifetime of memories stacked on top of each other in your basement and throughout your home. I hear so often that “we are working on our downsizing” and then we will make the move to our new home once that is completed. Well, 5 years later, I speak to the same folks who are still “working on it!” Another excuse for procrastination is that “I have to go through all of the papers and decide what to keep and what to shred”. If you just follow my story, all papers can go into plastic bins and labeled for future shredding and organizing. 90% of all papers are no longer necessary to keep. Today’s companies have all information online. Excluding tax paperwork from the last few years, it is not necessary to keep payment of every bill from the last 30 years! I hope my story will resonate with some of you who keep putting off that downsizing elephant in the room. You never know when you will find that perfect next home or community, so why not begin today so you are prepared when it is time to sell? The toughest moves are when nothing has been done to prepare your home and a move date is set for a few months. Imagine doing a basement repair, downsizing, preparing for the move to your new home and providing all of the paperwork needed to purchase a condo or move to a senior community…all done within a month or two! Don’t put off what you can do today especially when it comes to one of your largest assets…your home!